atmosphere of friendly competition (& rivalry!) on show day & newcomers are always welcomed & encouraged to have a go. You'll be suprised at what you may achieve & how addictive entering can become! To participate, you need to decide by the Thursday before the show (at the latest) which classes you will enter. You then need to submit your entry forms or email them etc. according to the Show Timetable in the show rules (click this link). On show day you need to prepare & pack your entries carefully & take them along to the hall between 8:00am & 10:30 am (you can also do this the Friday before the show between 7:00pm & 9:00pm). 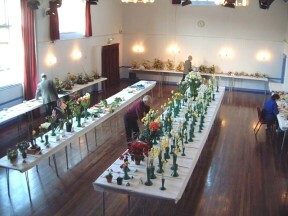 Once in the hall, you need to collect your show entry cards which are laid out on a table, then stage your exhibits in the relevant place with your entry card face down. 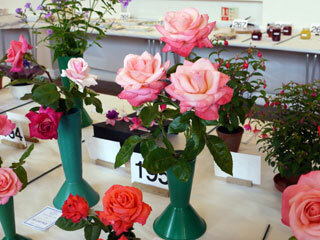 Plates & vases are available though for some classes such as flower arranging, collections of vegetables etc. you may want/need to provide your own 'props'. 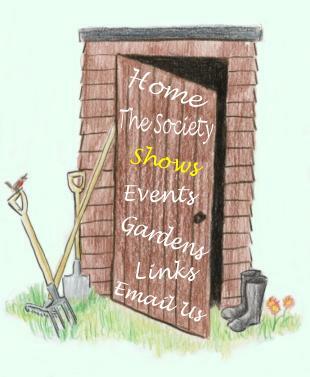 The Show Secretary & other committee members are at hand if you need any extra advice. At 2:00pm the doors open to the public and you get to look round the show & see how well you've done. Cups & awards are then given out after 5:00pm. Good luck! 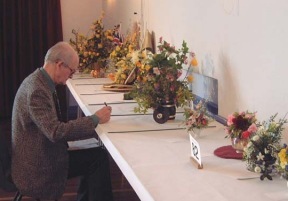 There are open & member classes in the shows & it is important to read the schedule carefully & follow the rules as laid out by the Society (in guidance with the RHS) so as not to make a mistake & risk wasting your valuable time & effort. These can be found in your LHS handbook of schedules and here. are made for the plant sale. 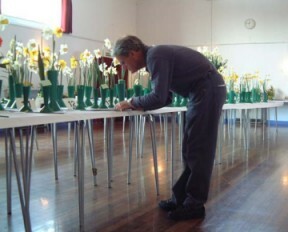 that, the Show Secretary & Superintendant go around & allocate prize labels & collate all the prize information for each class. At 2:00pm the doors are opened to the public & exhibitors. Admission fees are taken at the door. 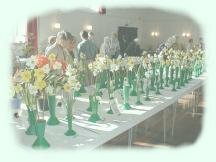 As well as tables stacked with flowers & produce, there is the obligatory raffle, and a display on stage with all the cups & trophies to be awarded. In the Jubilee Room there are delicious teas and cakes (made & donated by members) & the plant sale for seasonal bargains. Sometimes there is also a sale of greetings cards & occasionally there are demonstrations. 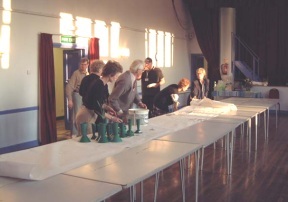 At 5:00pm the Chairman announces the cup winners, presentations are made, the raffle is drawn, surplus/donated show entries are auctioned off & the day is brought to a close. All that remains to be done is clear up!